With almost a decade of experience providing exclusively plus-sized womenswear, Navabi are true pioneers of the plus size retail industry. As one of the very first global retailers to argue that every woman should be able to find a size that fits her, Navabi focussed all their efforts on providing premium top quality designs from brands that you’re sure to fall for starting at size 12. Their in-house buyers are sure to bring plus size women along with them to ensure that they can combine the height of fashion with the practical needs of plus-sized women that are so often neglected by the fashion industry. This way there is the guarantee of lived experience and the first-hand approval of a woman like you behind each item of clothing listed on the Navabi’s website, giving credence to the belief that you shouldn’t have to change yourself for fashion, instead we change fashion for you. How do I use my Navabi discount code? Can I get style advice on my Navabi’s purchase? Sure! You’ll find suggestions on ‘how to wear it’ near the item picture on every product page, including inspiration for matching products. Is there a walk-in Navabi store? Currently, Navabi is exclusively an online retailer. Do Navabi have size guides for different countries? Of course. Check out Navabi’s sizing guide here for more information. Delivery time and costs will vary depending on the value of your item, and the options you choose. For more information click here. Returns are available up to 14 days after receipt to register your return. Put the invoice and the delivery note in the shipping container with your product. Sick of struggling to find an outfit online in your size? We all know the fashion industry has a narrow vision of beauty, particularly for women. Luckily Navabi are here to cater specifically to plus size women with a range of clothing to make you look as good as you feel. 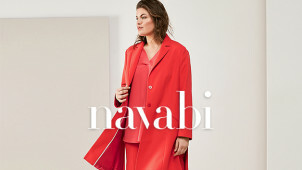 With your Navabi discount code, you could soon have your hands on some stunning new designs at a size that suits you and a price you can afford. Navabi offer you the option to shop specifically by body shape, as one of the few online retailers to give proper acknowledgement of the diversity in women's’ body shape. Choose from one of three common body types, often overlooked by traditional retailers, to find the right fashion to suit your needs. Feel confident and comfortable no matter what your body shape with Navabi’s guide to looking gorgeous, no matter your shape. With a showstopping selection of brands and designers, Navabi gathers together some of the top names in plus-size fashion, from Elena Miro to Vincenzo Allocca, and makes them easily accessible. With your Navabi voucher codes you could soon be wearing the dress of your dreams without a nightmare price. From top designer evening wear, to casual couch clothes, Navabi have the range to make you look great and feel even greater whatever the occasion.